The two adapters allow you to attach your Canon EOS camera to the telescope with standard 1.25 inch Eyepiece Ports. It offers 1.25 inch mounting sizes on telescope side. Compatible with Nikon F mount DSLR camera. 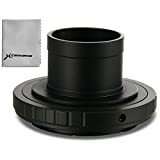 The two adapters allow you to attach your Nikon DSLR camera to the telescope with standard 1.25 inch Eyepiece Ports. Nikon F mount DSLR camera (D4 D4s D3x D3s D3 D810 D800 D750 D700 D610 D600 D300S D300 D200 D100 D7200 D7100 D7000 D5500 D5300 D5200 D5100 D5000 D3300 D3200 D3100 D3000 D90 D80 D70 ……). 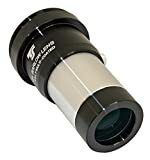 Providing an affordable entry into astrophotography, this nifty “eyepiece” camera contains a CMOS sensor chip with 8-bit output and RGB 24-bit color resolution. While not sensitive enough to capture images of deep space objects, the StarShoot USB Eyepiece Camera II enables you to share views of bright solar system objects and daytime terrestrial views of wildlife and scenery on your laptop or desktop PC. Our second generation USB eyepiece features improved resolution (640×480) and sensitivity over the original USB Eyepiece. With its fast frame rate of up to 30 frames per second (fps) you can use this very affordable planetary imager with your telescope to capture even fleeting celestial events such as occultations, eclipses, transits and more. Transmits live color images and video to your computer via the USB2 port.